Eucalyptus citriodora-This variety comes from Queensland, Australia. is also known as Lemon scented gum, Blue Spotted Gum and Lemon Eucalyptus. Eucalyptus Citriodora is called lemon-scented eucalyptus because it has a lemon scent. It is a calming oil, great to get rid of fungus, and very antiseptic. It is also a great anti-inflammatory. It is the main ingredient in many natural bug repellents. 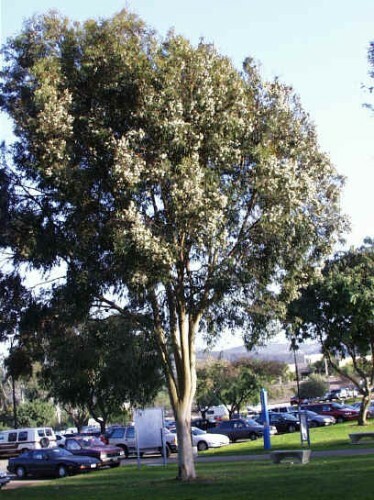 Eucalyptus citriodora is a large, handsome evergreen tree, 24-40 (max. 50) m in height; tall, straight trunk, 60-130 cm in diameter; open, graceful crown of drooping foliage; bark smooth, white, powdery, sometimes pink, red or blue-grey, on large trunks dark or grey and shaggy. Leaves can be used to give a nice lemon scent to a floral arrangement. Leaves can be added to hot water to breathe in steam to aid in times of congestion. Zones 9-11. Can withstand mild frosts.